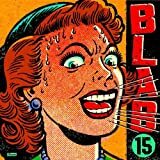 Having reviewed Blab 12, 13 and 14, there's a danger of having little new to say about Blab 15, the latest in this excellent series of collections of graphic art edited by Monte Beauchamp published by Fantagraphics. It features many of the same artists from the previous books, including Camile Rose Garcia, Walter Minus, Baseman, Blanquet, Fred Stonehouse, The Clayton Brothers, Sue Coe & Judith Brody, Greg Clarke, and Drew Friedman. The quality of production is high and the work is arresting and original, even if some of it is very similar to art that has appeared in previous books. Rather than describe each artist, I'll just focus on a couple of pieces. Maybe because it is so reminiscent of outsider art, I'm particularly drawn to "Four Horsemen" by Reumann and Robel. These are four pages of black pen drawing on white paper, with fantastic images full of bizarre details. There are clearly some religious themes, especially in the fourth page where signs are marked with "Dieu," (French for God), "Beyond," "Faith," "Reincarnation," and various Christian symbols such as crosses. The other pages have strange creatures, diners, hooded figures, executions and contortions. The pages are so full of small drawings that it is almost impossible to take in all the details, and it would take a better interpreter than myself to work out what it all means. Even without the help of the title of the piece though, it would be easy enough to identify the images as apocalyptic though. One of the effects of becoming more familiar with the work of some of these artists is that one notes how one's reaction to their work changes with repeated exposure. I think I was puzzled and even non-plussed by the work of the Clayton Brothers previously, but on seeing their contribution here, "Home, Take Them Out," I find myself more thrilled. It is a colorful painting, maybe some kind of oil paint on a hard surface like wood. The sharp definition of some of the lines in the work suggest some drawing was involved. It is an utterly bizarre work, with two adults and a younger person. The man who looks a little like Thom Yorke of the band Radiohead, wears a helmet or hat with the letters "DF" on the front and a T-shirt with "Rock and Roll Sushi." His left arm is extended with three hands attached: one holds a hose, one also holds the hose and has a small yellow bird sitting on its wrist, and the third seems to be scratching the head of a green cat walking upright and holding cardboard carton like you get from a Chinese restaurant, with "Day Time Fun" written on the side. The woman wears a short green dress with large yellow dots. She is riding a deer whose right left leg is bandaged. Behind her, holding on round her waist, is a doleful creature looking like a teddy bear in underpants. Behind the deer is another cat walking upright, wearing a T-shirt with the logo "Rosco's Chicken and Waffles." The cat is black, and has a beautiful pattern in white around its left eye. In the center of the picture is a boy-like being wearing black jeans and a white T-shirt with a "Mr. Softy" logo, sitting in a red wheelbarrow. He also has a pattern over his face, in green, but it extends beyond the borders of his face suggesting that it may be made of eyebrows and eyelashes rather than being something painted on his skin. On his lap stands another teddy bear creature in white underpants, dribbling. In the background are trees and patterns, and in the foreground a hand extends towards a faucet coming out of the ground to which the other end of the hose is attached, looking like it is going to turn on the water flow. It is hard to impossible to say what it all means, but it feels like some kind of family scene. Emotionally, it is both funny and alienating, with the two adults looking blankly at the viewer rather than at what they are doing. Some of the pieces in Blab 15 are political, some tell stories, some are colorful and some are dramatic black and white drawing. Nearly every piece has a forceful emotional tone to it, with lots of caricature and iconographic energy. The tone is crude, rude, countercultural and subversive. Much of it is also psychologically twisted and angry, yet at the same time there's a great love of the pictorial language of popular culture expressed in these images. It is very different from most comic book art and it is especially removed from the world of the contemporary art scene that you might find in the Chelsea art galleries in New York City. Fantagraphics deserves high praise for supporting this work. Recommended.